This is more a set of links than any well-developed thoughts of my own. I am too busy, too tired, too angry, to wrung thin by things from the personal to the global to say much on my own. So this, then, will be scattered thoughts with links what others have said. Two numbers have impelled a lot of Iraq retrospectives recently -- 5 years, the anniversary of Bush's criminal war that just passed, and 4,000 dead, the number of American soldiers who have died in the commission of that crime. 5 years, 4,000 dead: a lot of regrets are owed, and so some people are paying -- many with wooden nickels. But the latter number is, at best, misleading: far, far more than 4,000 people have died; that number doesn't include journalists, mercenaries, soldiers from other countries and -- most of all -- the many hundreds of thousands (if not more than a million) of Iraqi civilians who have died. Now, since our government has a powerful duty those who agree to defend it -- a duty, above all, not to waste their lives on criminal actions that end up harming our country (to say nothing of others) -- there is in fact some point to counting the dead American soldiers and noticing that number -- particularly given the sneering disregard for the lives of those "volunteers" that their commanders have shown. * But of course the primary point is, or ought to be, that human life is of incalculable value, and so that all human lives lost in this crime are blood on the hands of its architects. And by that standard -- the standard of our national creed (that all men are created equal, and endowed by their creator with certain inalienable rights, among them life, liberty and the pursuit of happiness), to say nothing of the religious creeds professed by the majority of our citizens (that all humans are made in the image of God) -- the amount of blood on the hands of its architects is stunning. About covers it, but not totally, because some people wrote more than that. First is this set of reflections by Andrew Sullivan. While this has led to disdain in some quarters, I think it's not warranted: however dumb his thinking before the war, Sullivan has shown genuine regret, and seems -- unlike most hawks of whatever description -- to have genuinely learned something. It's far more honest than most of the drivel on this topic, and worth reading. Even more honest is this set of mea-cuplas -- for once the term is deserved -- from John Cole at Balloon Juice. Now that's someone who's learned the lessons of the last five years. It won't have escaped anyone's notice that it was people who were wrong -- rather than the far more numerous people who were right**** -- who are being asked to write on their past judgments. This is mostly just a reflection of the American media: it is hawks and not doves who are given venues to express their views; no one is declared marginal for supporting war, however crazy the wars they advocate or however wrong they are (indeed, they are usually rewarded with plumb assignments), whereas those who support the legal principles our own country advanced in the wake of WW2 (in the Nuremberg trials) are considered fringe. But some of them spoke up anyway. Amen. That's the basic point, the nub, the heart of it: far too many Americans are casual about war, whether because it's fought elsewhere, or out of an exaggerated sense of our own righteousness, or because our political class likes them scared & compliant, or out of simple militarism, or whatever. Those who really saw war was a bad thing could see that the excuses offered were so flimsy that the idea was obviously -- and yes, it was obvious; this was, in the end, an easy call -- a bad one. He doesn't address his past views, but historian Eric Rauchway's reflections on the fifth anniversary of the war are also well worth reading (even if he highlights the estimate of 100,000 civilians killed, a number which is almost certainly far lower than the grim reality). So that's what I've been seeing recently. A good reminder that most of those who got the war wrong still are in the mindset that led them to get it wrong -- and hence are likely to repeat their mistake if offered the chance; that there are some honorable exceptions among those who got the war wrong; and that a hell of a lot of us were able to get this question right in the first place, even without the blunder before our eyes. Update: An additional link -- Hilzoy rebuts an attempt to justify hearing from those who got the war wrong here. * "Volunteers" is in scare quotes because, first and foremost, a great many of our so-called volunteer soldiers have been prevented from leaving the service when they were scheduled to by "stop-loss" policies -- policies that are clearly unconstitutional under the 13th amendment, even if there isn't a chance in hell that the Supreme Court will ever acknowledge this; and second, because so many of them volunteered, but not for this. The first thing I hope I've learned from this experience of being wrong about Iraq is to be less trusting of expert opinion and received wisdom... When it comes to continuing debates about the weapons capabilities of Iran and North Korea, I resolve to accept nothing on faith (including the NIE saying Iran has dropped its weapons program). In other words, Weisberg will express his regret for supporting an invasion based on false premises by being sure to keep an open mind about the merits of the trumped-up excuse for the next invasion. Wonderful. *** Don't do this. Really. **** Yes, far more: worldwide, the invasion was overwhelmingly opposed. The US is not the world. 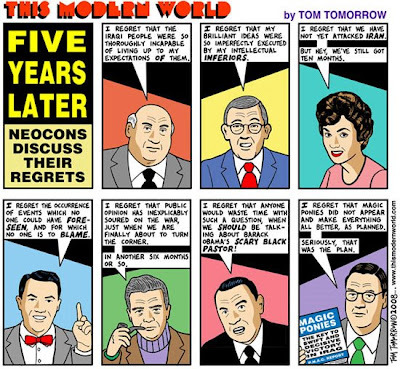 But of course plenty of us here were right too; we just weren't listened to. ...to all those celebrating it today, whether you're celebrating spring, the redemption, or getting lots of chocolate. • Torture, 24 and Scalia, by Scott Horton. • Why you should be against torture even if you think it may be morally permissible in some cases, by Publius. • "The first person to call me a self-hating Jew was my father" -- a fascinating essay exploring some of the dynamics of liberal Zionism & anti-Zionism from a personal point of view. • Funny, with a dash of bitter: oops. • Judging Obama & Clinton on their books. • Hillary Clinton and Rwandan genocide. A genuinely devastating report from Hilzoy. • Polls and how they each might win the electoral college. [Clinton] needs to convince the remaining uncommitted superdelegates to split for her by about a 2-to-1 margin. The only way she can get a split like that is if she can persuasively argue that Obama is unelectable. And the only way she can do that is to make him unelectable. Some people have treated this as an unfortunate byproduct of Clinton's decision to continue her campaign. It's actually a central element of the strategy. Penn is already saying he's unelectable. It's not true, but by the time the convention rolls around, it may well be. Time for the superdelegates to step in, I think. As someone pointed out, if enough of them endorsed, they could end this race today. Do it now, before Clinton manages to elect McCain in November. Ezra Klein adds a few thoughts here. Today's menu: Hallelujah, Comics, Humor, and Things that From a Long Way Off Look Like Flies. • ...But the one problem with that wonderful essay is that the author only provides the tiniest snippet of each of the versions he discusses. So you can go here to get mp3s of almost every damn version of Hallelujah in existence and rectify that. (Also here). • ...Except the most famous version of Hallelujah ever, the Jeff Buckley version. For that, you'll need to go here. • Also missing: the live version of K. D. Lang doing Hallelujah (the post linked above has the studio version, which is not as good methinks), which the Nielsen Haydens linked to some time ago; it's here on youtube. And also missing -- sadly -- is the version by the author of the blog history of Hallelujah; based on the snippet he gives, I'd like to hear more, but, alas, I have no link to offer for that one..
• Through Sunday night only: Comics Journal #288 is online for free. • Some time ago, I linked to this Oubapian transformation of Garfield -- removing his speech balloons -- which turned it into a really good comic. Now -- via the Howling Curmudgeons -- someone has taken this a step farther, and produced another -- even better? -- Oubapian transformation: Garfield without Garfield. A quite brilliant strip; check it out. • A three-year-old explains Star Wars. • Famous paintings photoshopped to include superheroes. • Nicholson Baker on Wikipedia. I like his emphasis on the damnable efforts by many to purge Wikipedia of its odder, charming, best articles. • If you imagine the Solar System as My Very Educated Mother Just Served Us Nine Pizzas, then you're way out of date. This little article will give you a capsule view of the as-currently-understood solar system -- with a pointer towards others that are out there. It also points towards this great little discussion of Dwarf Planets. • Why near-future SF is becoming impossible to write. • The literary sources of D&D (leftover from my recent Gygax surfing). Rather underplays Tolkien, I think, but still worth a look. • A psychologists vs. the mathematicians in the Netflix recommendation contest (prize: one MILLION dollars!). A neat essay (by Jordan Ellenberg, who I knew back in college). This is from Jorge Luis Borges, Selected Non-Fictions (p. 184), in the section entitled "Book Reviews and Notes". I present it here, unabridged; the ellipsis at the end of the second paragraph is in the original. I conceived it one night, one wasted night in 1935 or 1934, upon leaving a café in the Barrio Once. These meager circumstantial facts will have to suffice for the reader; I have forgotten the others, forgotten them to the point where I don't know whether I invented some of them. Here was my plan: to plot a detective novel of the current sort, with an indecipherable murder in the first pages, a long discussion in the middle, and a solution at the end. Then, almost in the last line, to add an ambiguous phrase—for example: “and everyone thought the meeting of the man and woman had been by chance”—that would indicate, or raise the suspicion, that the solution was false. The perplexed reader would go through the pertinent chapters again, and devise his own solution, the correct one. The reader of this imaginary book would be sharper than the detective. . .
Richard Hull has written an extremely pleasant book. His prose is able, his characters convincing, his irony civilized. His solution, however, is so unsurprising that I cannot free myself from the suspicion that this quite real book, published in London, is the one I imagined in Balvanera, three or four years ago. In which case, Excellent Intentions hides a secret plot. Ah me, or ah Richard Hull! I can’t find that secret plot anywhere. I came across this in the dead-tree version of this book -- which you can buy here, if you're so inclined -- and was determined to post it for the edification and delight of my readers; but I am grateful that I found the text on this web site, saving me the trouble of typing it in myself. Thus endeth the political career of the Governor of my fair state. Alas, Spitzer, we hardly knew thee. Aside from the sorrow in seeing a potentially potent progressive politician fall, and aside from the overwhelming sense of how can people in power be such ! @#$%ing idiots!? !, there seems to me to be one other pertinent issue here. Except, of course, it's not a private matter. It's not merely simply something that violates his obligation to his family and sense of right or wrong. Hiring a prostitute is against the law. Now, it seems to me that there is a damn good argument that it ought to be private. It is that sense that this is none of our business that Spitzer is -- understandably -- appealing to. Buzz off, he's saying. And if he campaigned against these laws, rather than enforcing them personally (see the Times story), he might have a point. But there's no justification for a powerful politician being able to say it's "private" if other people who break these laws are thrown in jail for it. This is just like the issue of drug laws: Obama, Newt Gingrich, and a host of other politicians all admit to having used drugs in the past. Fine and good: I don't care. But we shouldn't be locking up some people for what others are given a pass for. That's not justice: it's a war on the lower classes. Right now prostitution isn't a private matter. Maybe it should be. I might well vote to make it one given the chance (I haven't thought about it much, so my mind could be swayed, but that's the way I'd lean.) Perhaps it really ought to be private. I'd certainly respect people who made that argument. But Spitzer isn't saying, really, that it's private. He's saying that for people like him, it's private. And that is just a minor example of a far more pervasive rot in our country -- the idea that laws and the penalties for violating them only apply to the little people. Not to the new aristocrats. If you think it shouldn't be illegal, fine. But if you think it should be illegal, everyone -- men and women, whores and johns, governors and everybodyelse -- should be treated the same. Anything else is -- as someone said in a different context -- "a violation of... any sense of right or wrong." * Update: As I trust should be obvious to anyone who reads this post, let alone knows my position on other issues, the sentence "You can't say something is 'private' when the state enforces laws against it" is only true in a sense. Obviously there are a lot of things that are private, and ought to be purely private, that the state nevertheless meddles in. The point here is that Spitzer himself prosecuted these laws, and was in a position to change (or at least advocate for changing) them. And thus the "private" comment rubbed me the wrong way. But lots of things are (ideally) private, and thus things one might say (indignantly) "that's private!" that are, in fact, not (alas) treated that way. The point here is against a dual standard, one for the rich & powerful (& usually male), and one for everyone else -- not against privacy, which I (obviously) think is important regardless of what the law says. Update 2: Matt Yglesias makes the same point here, more succinctly. I dismiss nitpicking criticism which flirts with philistinism. If you think lipograms (texts written without using a particular letter) are silly, then you won't want to go anywhere near univocalisms: a univocalism is a text written employing only a single vowel: that is, it is a lipogram in four or five letters (depending on how its author treats y). Surprising as it may seem to some, though, the univocalism is not uncharted terrain for literature. In fact, I know of a number of different univocalisms: Georges Perec (who wrote the most famous lipogrammatic novel, La Dispiration (translated as A Void)) wrote two: a novella all in E called "Les revenentes" and a short piece in A called "What a Man!" (the original title is in English despite the text itself being in French). Perec's univocalisms have both been translated by Ian Monk: the first under the title of "The Exeter Text" (in an anthology of Perec's writings called Three by Perec); the latter under its original title, as part of his own set of six univocalisms, "Homage to Georges Perec". Also notable in Monk's set is the essay, "Perec's Letterless Texts", a defense of the whole notion of lipogrammatic/univocalic writing. Finally, Canadian poet Christian Bök has written an entire book, Eunoia, whose main chapters are a series of five univocalisms (the entire book is online at the link, if you're curious). It's an odd little corner of the literary universe, and one that will, without question, not be to everyone's taste (many will be surprised that it's to anyone's taste). I have had on my hard drive for over a year now a lengthy half-finished post, considering the aesthetic merits of these works. -- But that's not what I'm here to talk about today. Today I just want to ask a question: what is the longest naturally occurring univocalism in English? By naturally occurring I mean unplanned -- none of the texts cited above count: they were all deliberate. I want to know how long a stretch of prose can be found which unintentionally -- without the author even noticing (at a minimum until after the fact) -- uses only one vowel. A parallel question concerning pangrams has been asked; it's the search for the shortest pangrammatic window (i.e. series of unplanned, naturally occurring text which uses all 26 letters; so far the record is 47 letters). But if anyone has asked about the univocalic window, I have yet to find it. The spell-checking dictionary for my copy of Microsoft Word (Version 2004 for the Mac) has "desegregation" listed, but not "resegregation". So, too, does the 2005 Apple Dictionary that came with this computer (which often has words that Word does not), the spell checker that comes with the blogging software upon which I am writing this very entry, and the automatic spell checking that Firefox provides which now (quite conveniently) underlines questionable words as they are typed. All of them flagged "resegregation" -- offering, as a possible correction, "desegregation". A tiny fable about how we'd like to see ourselves versus how we really are. "I'm thirty-seven, I'm not old"
Today, I'm thirty-seven (I'm not old). After Obama advisor Samantha Power blurted (in a comment she tried almost instantly -- but futilely -- to retract) out that Clinton was a "monster", the Clinton campaign demanded she be fired (despite her having already apologized); within hours she resigned. But the Clinton campaign has a key figure who is saying something far worse -- and far more destructive for the Democrats in the general election; namely, that while McCain is qualified to be Commander in Chief, Obama isn't. And this figure has been saying it over and over. It's behavior that one (notably temperate and balanced) liberal blogger has called "disgraceful". So, clearly, that Clinton campaign figure should resign too. Or, failing that, should be fired. I really see no choice. The Clinton campaign must fire Hillary Clinton. ...let me tell you, R. buddy, this game is weird. The basic idea in your run-of-the-mill Go Fish-type game is to get all your opponent's cards or all his checkers or some other readily grasped commodity. Not so with D&D. Here is a quote from Mr. Gygax on the subject: "The ultimate aim of the game is to gain sufficient esteem as a good player to retire your character--he becomes a kind of mythical, historical figure, someone for others to look up to and admire." There are two main problems: (1) there are one billion rules, and (2) the game requires nonstop mathematical finagling that would constipate Einstein. The rule book is laden with such mystifying pronouncements as the following: "An ancient spell-using red dragon of huge size with 88 hits points has a BXPV of 1300, XP/HP total of 1408, SAXPB of 2800 (armor class plus special defense plus high intelligence plus saving throw bonus due to h.p./die), and an EAXPA of 2550 (major breath weapon plus spell use plus attack damage of 3-30/bite)--totalling 7758 h.p." Here we have a game that combines the charm of a Pentagon briefing with the excitement of double-entry bookkeeping. Equally funny for the player & the newbie, I think -- although in different ways. Read the rest here. Also fun is this Believer article from a few years ago describing a journey to Lake Geneva, Wisconsin, to play D&D with GG himself. (via) But it's not as funny, nor as succinct, as Cecil Adams. Poem of the Day: Harry Mathews, "The Maoist's Regrets"
Naturally, a poem made up of perverses is also a cento -- albeit a cento of a certain type. The following is a Cento by Oulipo member Harry Mathews; it too comes from the Oulipo Compendium (p. 78 of the recent second edition). Shall I compare thee, China, to Peru? The old order changeth: blow his wreathed horn! The feathered glory of an April day. Something there is that is a joy forever. Friends, "Romans", country? Never, never, never. To my ear, it is, in fact, a good poem -- and certainly one which required a fair amount of creativity to put together, albeit creativity of a somewhat different sort than writing an original sonnet would take. But you could say something similar of all transformative art. Obviously the play with the borrowed words -- changing their meaning with the context, etc. -- is a part of the pleasure here. Both halves of the lines Mathews's borrows are used in six cases -- split up and used in different lines of "The Maoist's Regrets", but still both halves are used. Sixteen other sources are used only once, i.e. only half the line is used at all. My first thought was that the first half of the tenth line was from this Frost poem -- but it can't be, since that leaves the "and" unaccounted for. So Othello it must be. -- Since I don't know the date of the Wharton poem, it's not to me clear which came first; most likely the Johnson, but Wharton was twenty-one in 1749, so it's just possible that his poem came first. "...what honour and request the ancient poetry has lived in, may not only be observed from the universal reception and use in all nations from China to Peru, from Scythia to Arabia, but from the esteem of the best and the greatest men as well as the vulgar." This reads somewhat as if it were a stock phrase. Bartlett in his Familiar Quotations, refers, under Dr. Johnson, only to Thomas Warton. A similar point was made more recently by Laura Brown in a footnote to Fables of Modernity (2001). At any rate, my suspicion is that Harry Matthews got it from Samuel Johnson. ...six more weeks of winter. Update: I don't want an irresistible joke to leave this jaunty: I'm in fact incredibly depressed by last night's results. Rush Limbaugh got what he wanted: it's going to be a long, drawn-out campaign, heavy on the negatives. I think the Republican's chances just got a lot better in November. I think Clinton is still a long-shot to win the nomination... but she has a good chance of taking Obama down with her. (And if by some miracle she wins the nomination, she certainly is very likely to loose the main race.) It was a good night for McCain -- which means, perforce, a bad night for America, and the world. And it's going to be a long six (actually seven, I think) weeks until we get another chance to put it behind us. -- then we should forgive those who supported it. But even then we should never, ever, ever forget. It's scary to contemplate the amount of my psyche that this man influenced, and the amount of my consciousness that he helped to shape. Rest in peace, Gary Gygax. Update 2: Xkcd weighs in. 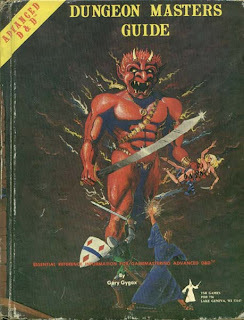 (again via ML) Also worth a look is this nice piece on D&D (hence, Gygax's) influence on the culture in some unexpected areas (via some chain of links starting here). I think just a hint of this influence can be seen in this 1983 Gygax quote (from this Post obit) about people's reactions to the game: "People said, 'What kind of game is this?' You don't play against anybody. Nobody wins. It doesn't end. This is craziness!'' -- The many ways in which such activities are integrated into (many of) our lives now is a hint of his vast influence.